I have seriously fallen in love. I would speak for The Boy too, but this is a love that I have developed in recent times. Just thinking about my newfound love, my heart beats a little faster. My mouth waters just with the mere mention of its name. It’s cute (and perhaps cuddly) and trendy. It’s a place to see and be seen (without being too pretentious). It’s wait staff are probably the best I’ve had to encounter in recent times, its service is unparalleled. 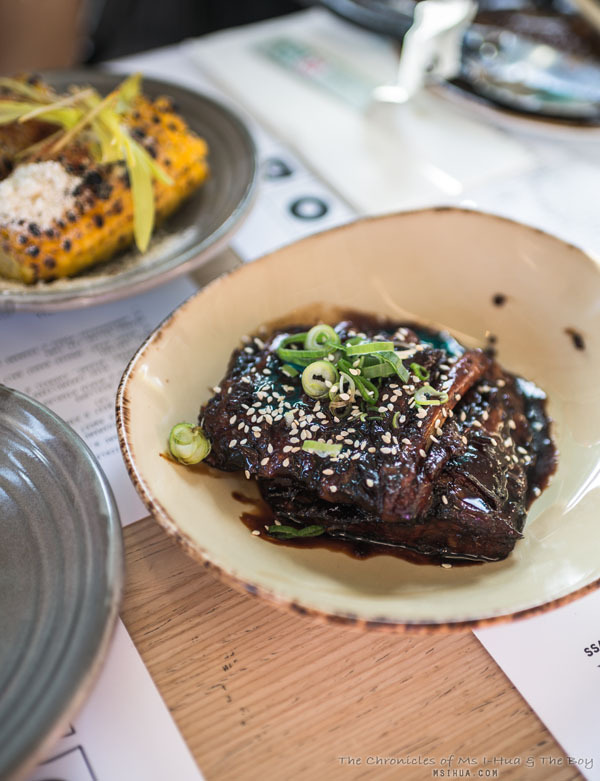 Who else could this be, but than the ‘new’ Ben Cooper and Chris Lucas’s collaboration, Kong BBQ. An addition to the Lucas Group’s growing repertoire of a system that works (namely Chin Chin and Baby). Get rid of the fine dining, bring in casual dining. Get rid of the reservation system, lock in a no-booking system. Throw out what you know of traditional Asian style food, replace with modern fresh hip cuisine with an Asian twist. Bang! You’ve got a recipe that seems to work. Judging by the long queues of people waiting to get into these establishments as well as the never ending flow of punters coming through, it seems to be a risk worth taking. 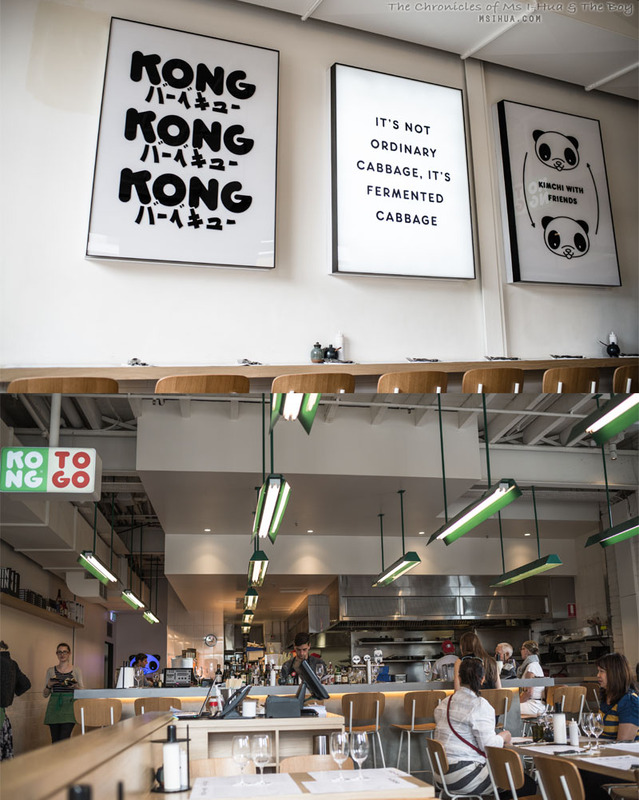 Putting all my love aside for Kong, on a serious note, we certainly couldn’t help drawing comparisons to Kong and Momofuku in NYC. 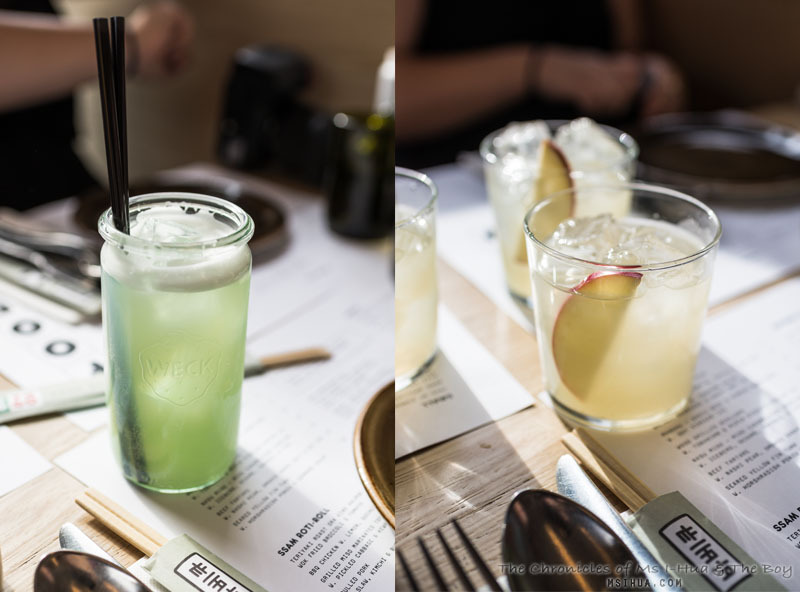 It’s a combination of David Chang’s genius of Ssam Bar, Noodle Bar and Milk Bar. So you can’t really say that what Kong is offering is new by any means. 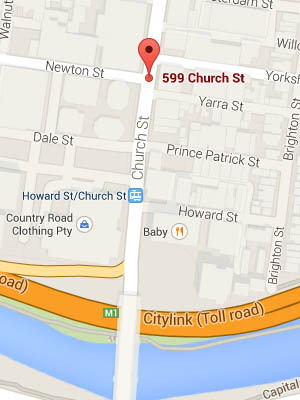 However, you can say that it certainly is ‘new’ to Melbourne. And IMHO, I couldn’t really give a damn that this seems like a copied recipe of success. All I care about is that there is this amazing restaurant that I can come by with my friends at anytime (past 11am) on anyday and have a good meal! I’ve been back three times now, and each time I’ve fallen just slightly more in love (if that were possible). 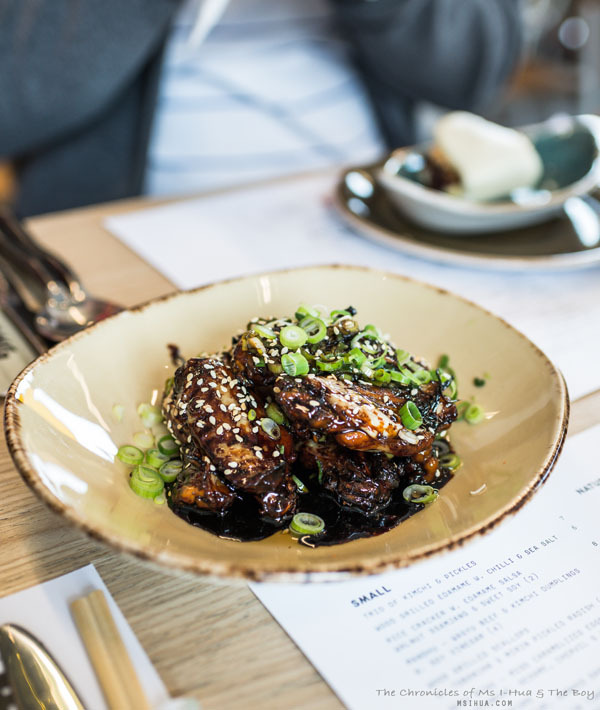 Ms Looney Tunes has developed an intolerance to fructose over the years and being a Korean joint, it seemed nigh impossible that we would be able to find a dish for her without fructose laden dishes. Everything had some form of garlic, onions and god forbid, apples! The waitress we had that night was superb. All three of us exclaimed that we would have gladly taken her away with us so that she could always take such good care of us. On her own initiative, the waitress (we missed her name!) took the menu away and shortly after, returned with every single item on the menu marked with an X, O or an XO to indicate the ingredients which Ms Looney Tunes couldn’t have. All three of us had our jaws on the floor. The second time I visited, was right after the races with The Boy, Taz and Maz. We had started pretty early, not eaten much and decided to have an early dinner (around 4:30pm). Once again, we were blown away by the quality of the service and tastiness of the food. This weekend gone past, we managed to drop in again with overseas guests as we couldn’t get into any cafe (it was late, around 3:15pm). This is definitely highly recommended. It is also recommended that you order one serve per person. If you have space, order all four varieties! I’m seriously hooked to the soft shell crab bun. Maz is firmly a staunch believer in the brisket and The Boy can’t move on from the pork belly. All three of us are adamant that our favourites are the best (mine of course is the true winner :P). 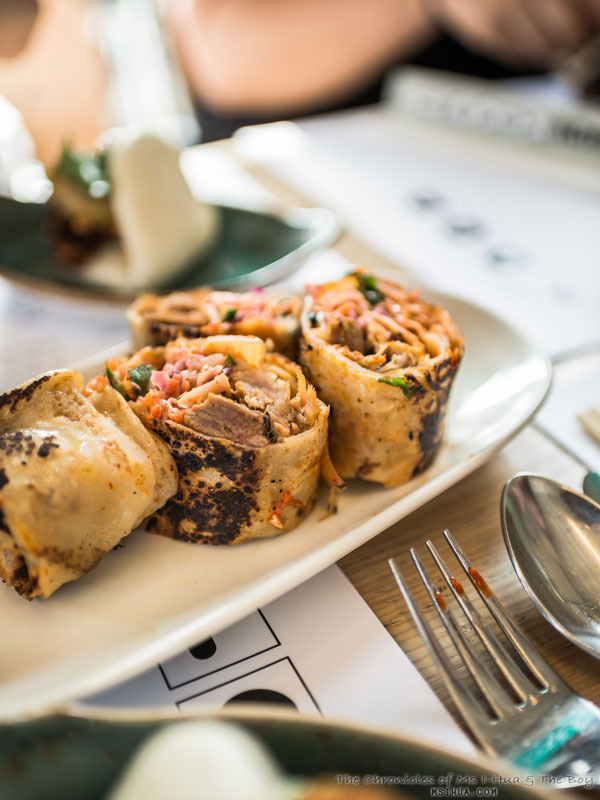 For some strange reason, the second time we were there, one of the waiters brought to our table a complimentary serve of a Ssam Roti-Roll ($12.00 each). When we queried it, he was like “It’s on the house!” and walked away with a smile. I think the cameras snapping away may have had something to do with it. The only other thought I have is that the kitchen accidentally prepared too many orders and they had to get rid of it. Any how, the four of us tore into it like the ravenous souls we were. 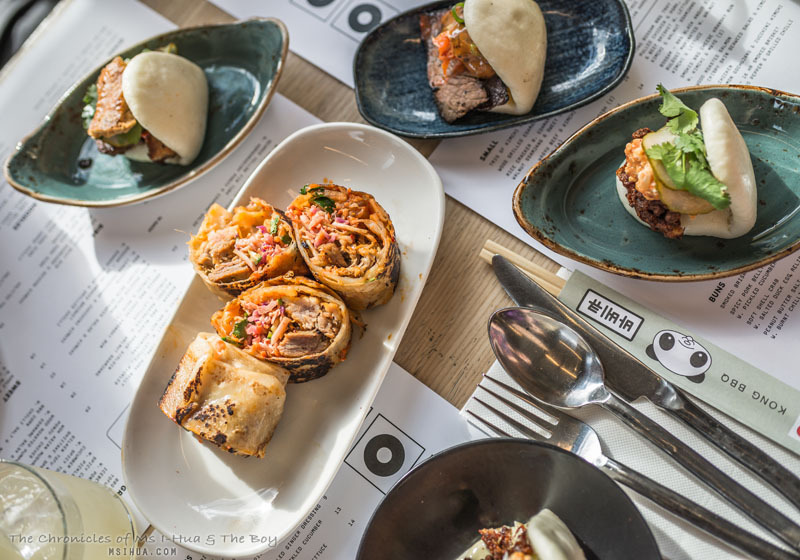 We also commented that, based on the menu descriptions (and other choices tempting us), the Pork Roti-Roll (pulled pork with slaw, kimchi and burnt chilli mayo) wouldn’t be something we would have normally ordered. But OMG! It was so damn tasty! Thank you Kong! Under the wings option, I’ve also sampled all three varieties on the menu. I’ve also tasted the Hot Wings with Gochujang and Chipotle (so spicy). The BBQ Soy Wings with Sesame and Spring Onion was a tad salty and it needed some form of rice/carbs to compliment it. All the flavours go so well together. The nashi pear certainly cuts through the rich fattiness from the pork belly. 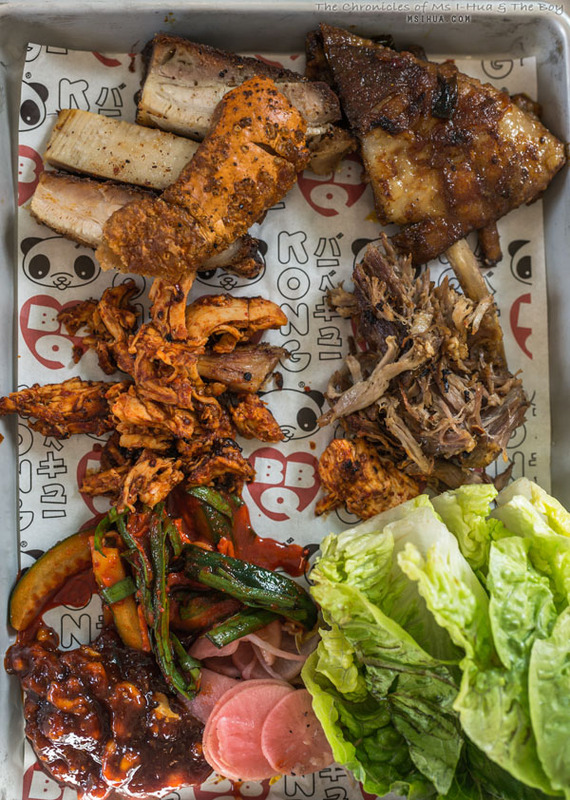 We have also tried the Kong Bossam BBQ Tray ($29.00) which is essentially a meat platter of all things good and happy. As they say in Kong, “Happy Life!”. 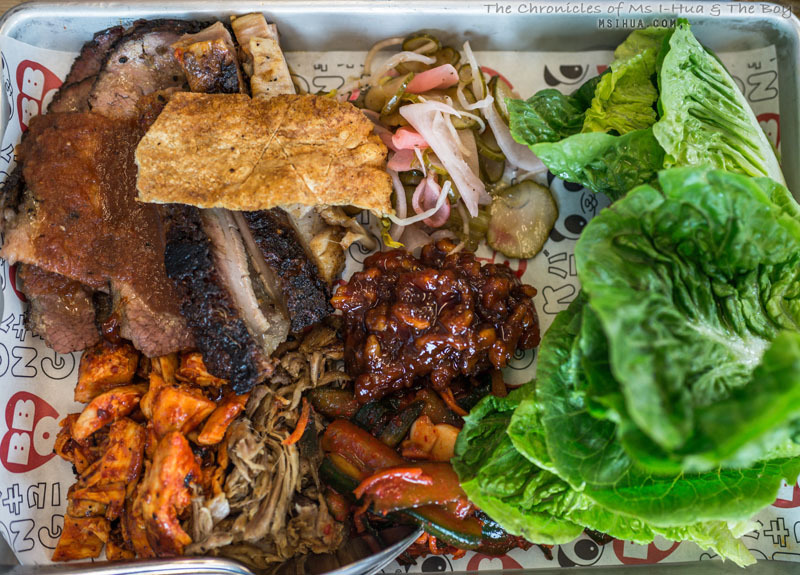 The Bossam comes with a range of meats, namely Pulled Chicken and Pork, Pork Belly, Beef Brisket (and/or Lamb Ribs) with lettuce, pickles, kimchi and walnut ssamjang. The Walnut Ssamjang is to die for. That is saying a lot as I usually dislike walnuts (it’s the one sad nut that I often leave out of my diet when attacking the trail nut mix bag). The only thing I would have to say with this tray is that there isn’t ever enough lettuce leaves! 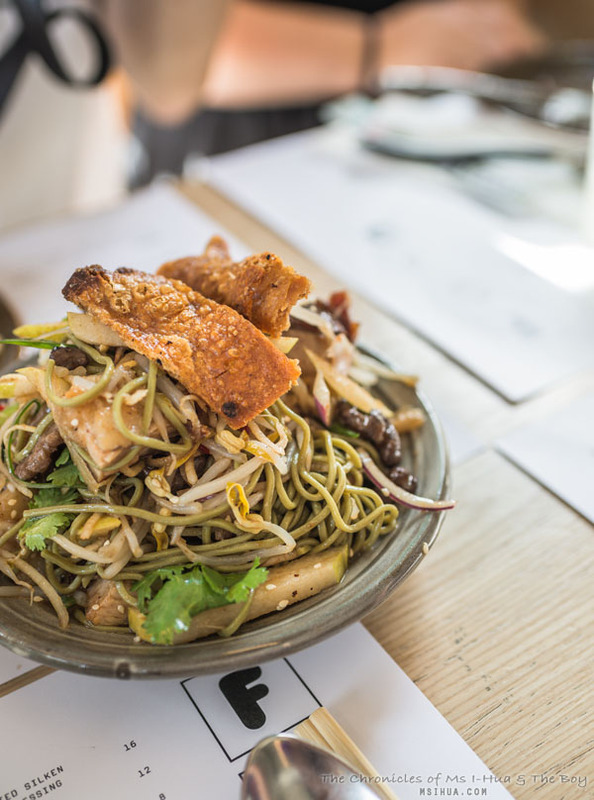 With so much meat on a platter, it can get a little heavy in the protein department (particularly since the flavourings are quite strong, salty and punchy which certainly calls for more salad greens or rice). 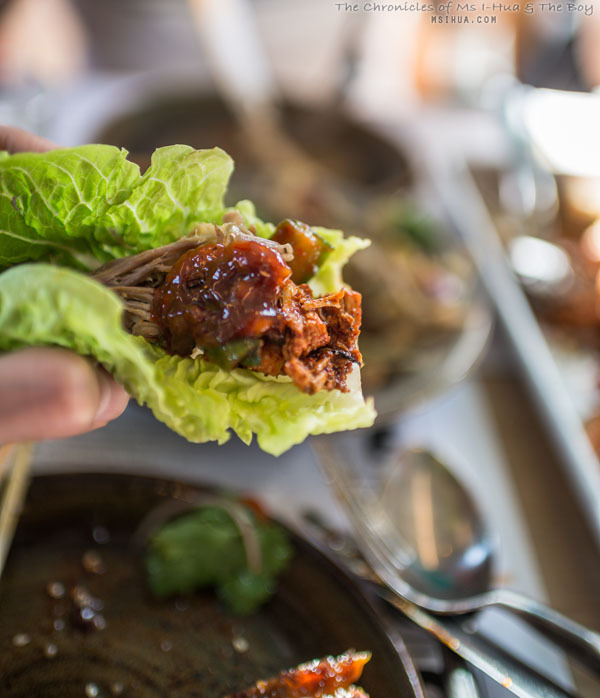 Most of us end up taking a baby lettuce leaf and tearing it into two. 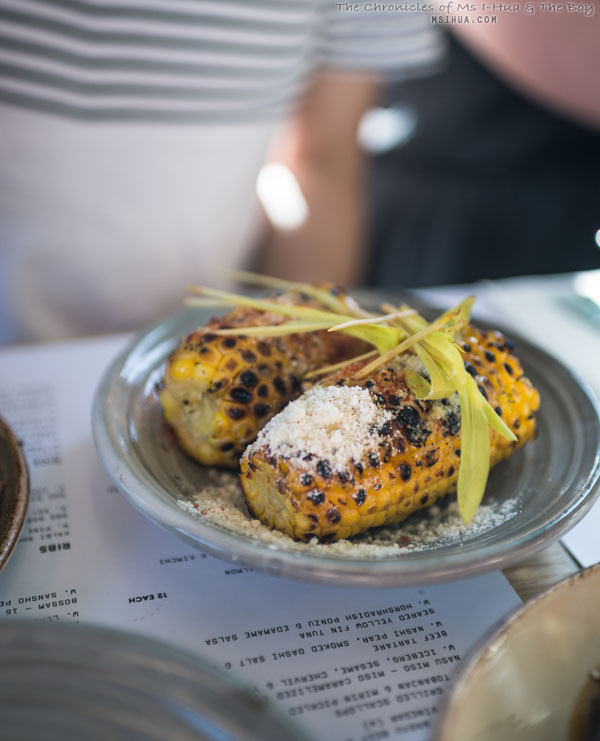 Another thing that you shouldn’t miss is the BBQ Corn with Crack on the side. Okay, it’s cheese (or something), but it sure is like crack to my palate and soul. Give me more right now! Being huge fans of meat and pork in general, we decided that we (2 out of 3 times) didn’t quite have enough meat on our table and ordered the BBQ Baby Back Pork Ribs with soy and sesame. Like the other sesame and soy laden dish (see chicken wings above), it was a little on the salty side, but we couldn’t stop eating. Addictive sauces Kong does would be what Yoda would say if he visited. When should you visit to avoid the dreadful long wait/queues? Try visiting at odd hours (our last two visits were well into the high-tea/afternoon tea time slot) or come early on a weekday just before 6pm to grab a table. Wow you’ve managed to try so many items off the menu already! 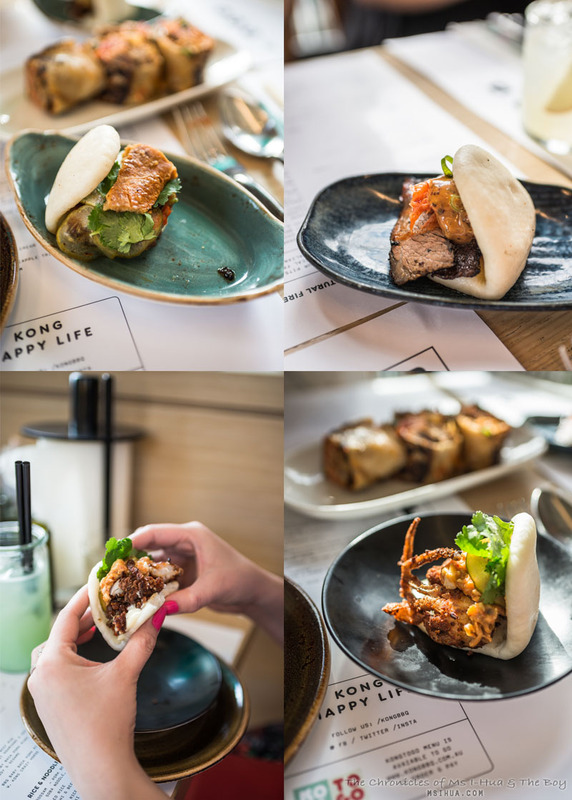 I’ve only been once thus far, and had only the soft shell crab bun and the bossam tray which were both SUPER YUM! 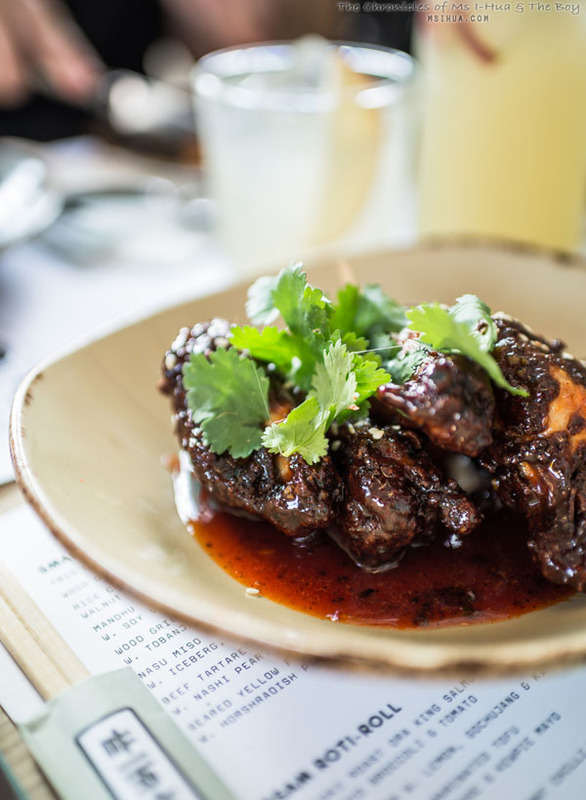 I can’t wait to be back to try the roti and the ribs – arghhh so hungry now! Roti roll that good and it’s complimentary! That’s a steal!!! Love the look of that honey fried chicken, OMG!!! This place sounds, taste, looks good almost smell it. Definitely wanna try. Not a fan of the “no reservations ” policy. The od hours won’t be so od anyone. They did a pop up at Rue & Co opposite the office. I wanted to try but the limited menu was not that interesting. Also I’m not a kimchi fan.. not sure if I will like it.